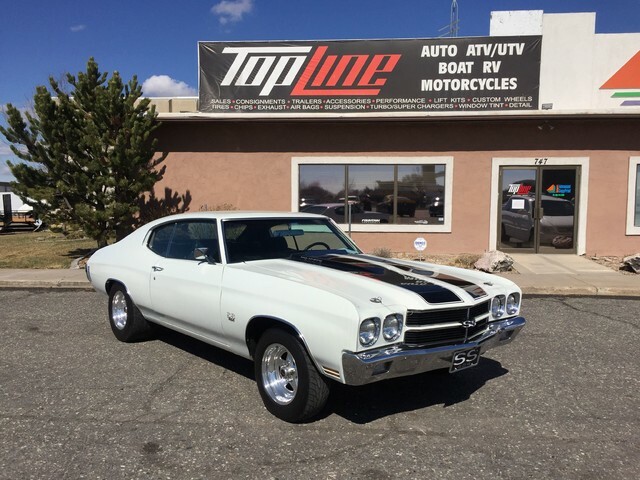 This car is a completely rebuilt, from the ground up, 1970 Chevelle SS with a 468 Big Block with less than 3000 miles, brodix aluminum heads, high rise intake, ARP Fasteners, Holley 1050 dominator carb and 2″ ceramicoat headers. The transmission is a brand new Tremec 5 spd. 4:11 Strange gears with 33 spline Strange axles with lockers. Most of it’s life it sat in a garage only driven 2 or 3 times a year. The paint has a beautiful pearl overlay in the clear coat, base coat is white with black rally stripes over the cowl induction hood and trunk. The firewall has been completely smoothed out and all wiring has been hidden. This car is a blast to drive and you better hang on! It is also fun to cruise down to your local car show or coffee stop. We represent and describe our inventory the best we can and by providing as many photos as possible. If you want more photos please text Jeremy @ 801-510-7858. We are only 30 min from SLC International airport and can make arrangements to pick you up if you would like to see or hear the car run in person.